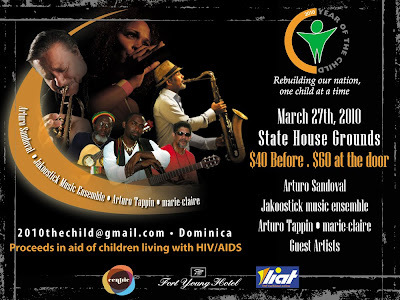 BET Centric and LIAT have joined Dominica Beverage and Brewery Ltd., Fort Young Hotel, and LIME as sponsors of the second in the Year of the Child Concert Series headlined by Arturo Sandoval, Arturo Tapin, marie-claire and Jakoostick Musical Ensemble. 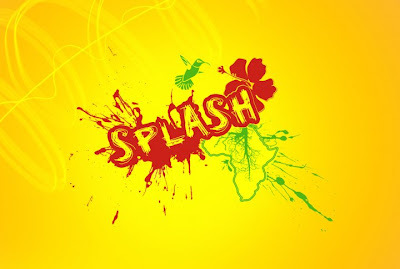 Footage from the jazz-themed event will be shown on SPLASH!, a BET Centric programme featuring Caribbean lifestyle and music. According to Splash’s executive producer Kibwe McGann, one of its mandates is to show the charitable efforts of Caribbean entertainers. “We recently featured Shaggy’s concert benefiting the Bustamante Children’s Hospital in Jamaica, for example. Also, one of our hosts Leah Marville, has a charity called The Love Campaign, which focuses on children living with HIV/AIDS. Year of the Child deals with charity as well as music, thus we saw that we could easily merge both products.” Leah will be joined by co-host Crystal Cunningham for the live taping that will air in late April/early May. 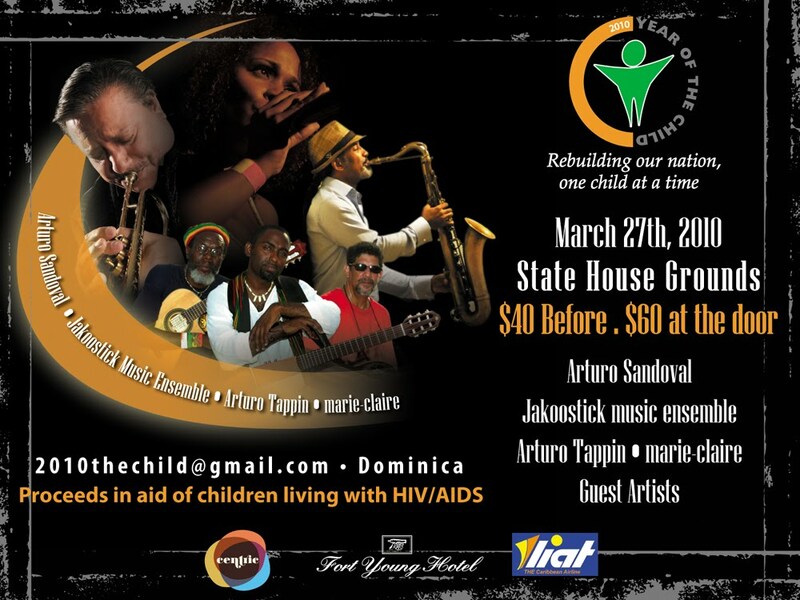 LIAT is also assisting this effort by providing travel for artists to Dominica. In addition, the event will receive coverage in the airline’s in-flight magazine Zing. The first Year of the Child Concert, headlined by Reggae artists Queen Ifrica, Tony Rebel and Nelly Stharre was held on January 9th at Krazy Koconuts. A check for ECD$20,000.00 from its proceeds was presented to Camp Rescue, an organization providing life skills to at risk youth. The five members of the Year of the Child Concert Series Committee—Cornell Phillip, Anna Raffoul, Emile Raffoul, marie-claire, and Nelly Stharre, are encouraged by the support of the Dominican public towards their efforts to enhance the lives of local children. Look out for upcoming shows throughout 2010 featuring a variety of Caribbean talent at various locations throughout the island. SPLASH is a Caribbean music and lifestyle show aired on BET Centric Saturday’s at 8AM and 2AM with repeats on Wednesdays at 10PM. SPLASH! celebrates the explosion of Caribbean talent on the international stage by including engaging features and profiles on celebrities and personalities such as Shaggy, Asafa Powell, Lennox Lewis, Konshens, Hal Linton and Shontelle Layne just to name a few. SPLASH! is executive produced by Jamaican Kibwe McGann (former executive producer of BET J’s Wicked Style). The show, which has covered 9 islands withn the region, as well as South Africa, has three hosts shows hosts are: Miss Barbados World 2009 Leah Marville (who also placed 17th in the 2009 Miss World pageant and was crowned Miss World Caribbean Continental Queen 2009, she was also voted Sexiest Woman in the World 2009 by Global Beauties), international actress and model Crystal Cunningham from Trinidad who along with Leah is a Saint International model and Tamara Eniss from Jamaica, formerly of Newstalk 93 FM at UWI Mona Campus. BET Centric (formerly BET on Jazz, BET Jazz and BET J) was launched in 2009 and is available in 28 million homes in the US and an additional 8 million in the Caribbean. It is a general interest channel geared towards African-American adults. Founded on in 1956, Leeward Island Air Transport (LIAT) operates a high-frequency inter-island scheduled service to 21 destinations in the Caribbean. The airline is headquartered on the grounds of the V.C Bird International Airport in Antigua.